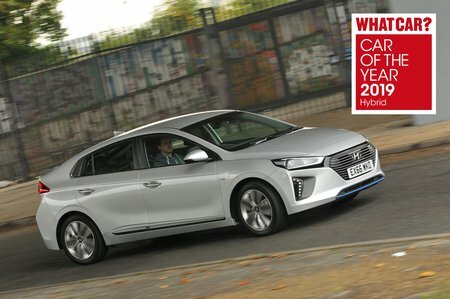 Hyundai Ioniq 1.6 GDi Hybrid Premium 5dr DCT 2019 Review | What Car? What Car? will save you at least £1,714, but our approved dealers could save you even more. The Hybrid is the most viable option, due to it's good balance of weight, body control and power. The steering stays on the light side – there is a Sport mode but this then adds too much weight – but it’s accurate and throws in enough resistance as you apply lock to help you place the car easily. Around town, the Hybrid rides a little more firmly than a Prius, but not to the extent of being uncomfortable. The payoff is a settled ride at faster speeds, especially if you encounter a set of long, wavy dips and troughs.